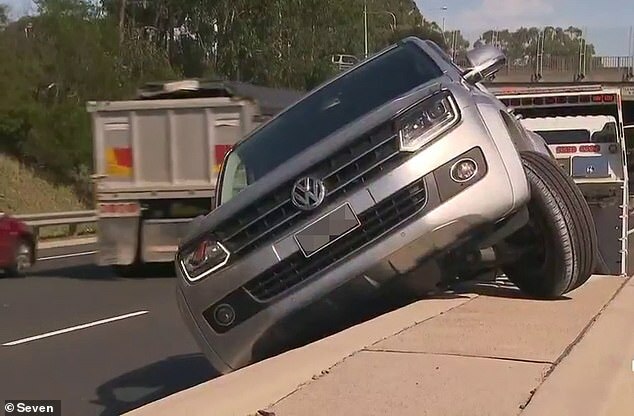 A man has admitted to taking speed, merging onto the opposite side of a highway and mounting a concrete barrier in a bid to avoid paying a toll. 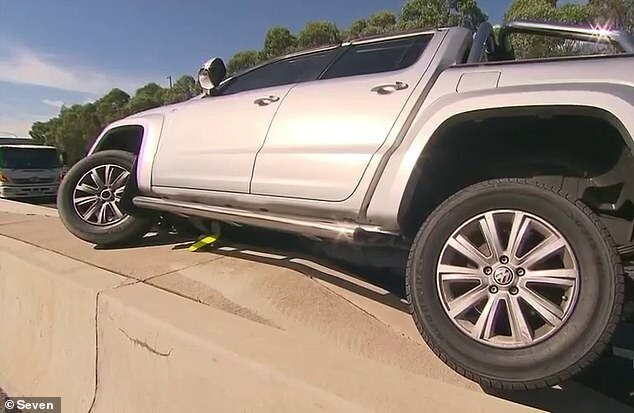 Frank Mollica, 47, drove his ute up the exit-ramp on the M5 highway near Hammondville in Sydney’s south-west during peak hour traffic on Saturday morning. After driving around 10kms into oncoming traffic, the brick-layer then scaled the concrete barrier trying to avoid another toll. The silver Volkswagon ute suddenly tilted sideways before two of the wheels lifted into the air, leaving Mr Mollica airborne and stuck. Despite the severity of the crash however, Mr Mollica, who lives in Georges Hall, appeared nonchalant. 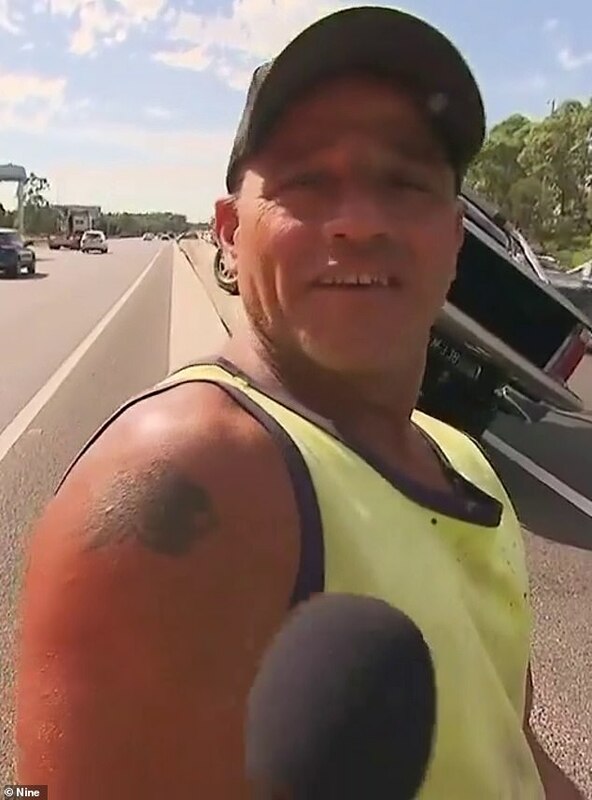 ‘I got on about four tollways ago and I was trying to avoid the toll,’ he casually told 7 News. He then said he had tried to mount the ‘little bit in the middle’ but it hadn’t worked. ‘I don’t know how I got up here, I was trying to jump it really,’ he said. ‘I’m surprised I survived it,’ he told Nine News. Inspector Phil Brooks from Highway Traffic and Control said it was one of the most ‘grave and dangerous events’ that they had seen in a very long time. Mr Mollica also admitted to both police and reporters that he had taken illicit drugs before he got behind the wheel. ‘[I’ve taken] a bit of speed in the last two days at a party,’. Mr Mollica was arrested and taken to Bankstown Hospital where he underwent several blood and urine tests. He is expected to face several traffic offences including dangerous driving.